Motorcycle fuel tanks offer suffer from corrosion problems. Some fuel tanks require de-rusting and lining, and there also fuel tanks that demand base cutting and a new panel welding. In order to prevent big damage to your motorcycle fuel tank it needs maintenance. Moreover, there are various products on the market that prevent this rusting from happening and one of these products is gas tank sealer from our offer. 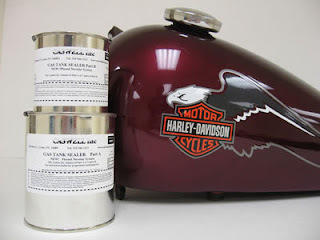 Motorcycle fuel tank restoration should always start with a product like GTS1750 which is a gas tank sealer whose purpose is seal leaks and prevent corrosion problems. With the usage of this product you can avoid greater damage and spending a lot of money on mechanics that will have to repair everything. This is a chemical-resistant material that is able to withstand permanent immersion of many strong and harsh solvents, oils, and fuels. After the application of the gas tank sealer, the powerful membrane is formed. The membrane doesn’t crack which isn’t the case with products from other manufacturers. Moreover, this membrane won’t cause damage to the engine and it definitely won’t plug lines. Since the primary aim of motorcycle fuel tank restoration is prevention of rust you can be certain it will not be formed in fuel tank again as condensation won’t be able to contact the metal. As nobody likes complicated processes and corrosion of fuel tank is complicated enough, this gas tank sealer is applied easily making motorcycle fuel tank restoration a quite simple process. You just have to prepare metal tank by placing nuts and bolts or even a piece of old bike chain inside together with a pint of lacquer thinner and shake the tank in order to eliminate any loose particles. When all particles that might be in the tank are removed, drain the liquid and let it dry. The next step is the application of our gas tank sealer which is done in a very easy and fast manner. Make sure you allow it up to 7 days to harden any settle in properly. After that, your motorcycle fuel tank restoration will be over. In turn, motorcycle fuel tank won’t suffer from rust again which will prevent any further damage in your motorcycle and, in the long run, save you a lot of money you’d spend on repair. Kits we offer are available in different colors and you can choose the right one according to your own preferences. For example, there is crystal clear, dragon blood red, black, and blue gas tank sealer. This makes our product stand out from other manufacturers as they usually don’t offer their products in a wide range of colors. If you live in England, then you are more than welcome to visit our company and let us restore your motorcycle for you. Regardless what you purchase the product or our service your satisfaction is guaranteed. The customer’s satisfaction is confirmed by the fact that our company has more than 80 years of experience in motorcycle restoration field. Feel free to contact us via our phone or e-mail in order to find out more about gas tank sealer, motorcycle fuel tank restoration or any other questions you might have.